At last I got the opportunity to do some astrophotographing, it's not easy when living in a big city. A friend asked if I wanted to follow him to a dark place outside the city and doing some astrophotographing. Now I got the chance to take astrophotos with my Pentax medium format lens and compare with earlier photos with the Sigma APO lens. The object this night is the M45 nebula. This is a crop of the M45 central region. The upper one is the Pentax lens photo. Haven't done very much more then flat calibrate it. The lower one is from the Sigma APO lens. Both has been scaled by a factor by 4 to let us see the details. Some ugly jpg arte facts can be seen. The strong bleeding from the old Pentax lens, the red and blue channel is not that ugly after color channel gain is set correctly. Actually it helps the oversaturated star to give some color information. The light spreads over more pixels. I didn't have any problem to focus at infinity, not much margin do. 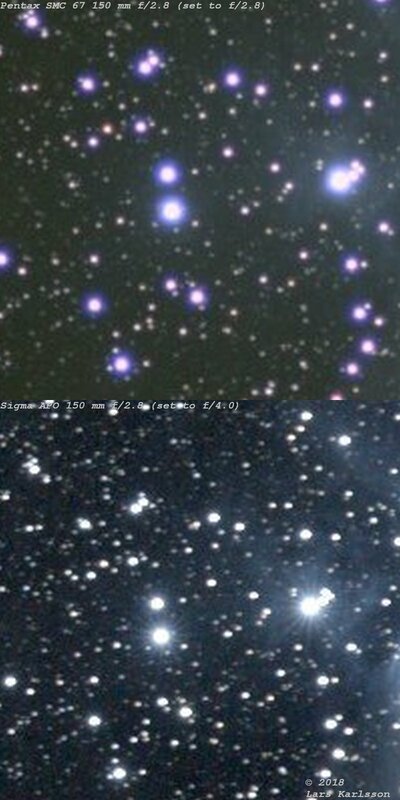 On the Sigma lens when using the aperture stop down to f/4 a lot of rays can be seen around brighter stars. A common problem when the aperture is not fully open. What is to prefer, colored ring as I get from the old Pentax lens or rays as I get from the Sigma lens when stopping down the aperture? At that time I took the Sigma photo had a problem to achieve correct tracking at 120 seconds exposures. Which one is best? Nowadays I'm strongly prefer a lens that have a focus motor, the Sigma and all newer Canon lenses have that. But when looking at these photos the Pentax doesn't look too bad, it even looks to be sharper. We had a lot of clouds rolling in over us when I took the Pentax photo so it's not so easy to compare them. They are taken with different settings, the Pentax photo is a mix of short and long exposures with different ISO settings. The Sigma photo is only taken with 120 seconds photos. I have to do a much better test in the future with more control of the environment and at the same setup. But not sure if I will do that, there is so few times per year that I have the opportunity to do astrophotographing. When I doing that I want to spend that time with equipment that I have more control over, like the Sigma lens with the focus motor.